Sephora has added a new line to their store. Mischief abounds in the magical world of tokidoki, where one glance is never enough. Creator and Italian artist Simone Legno brings his cult-favorite designs and colorful interpretation of life to a new makeup and accessories line that exposes the criminally cute and irresistibly edgy sides of beauty. 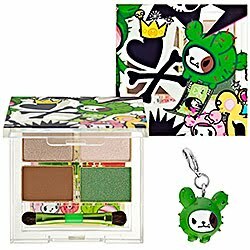 Presented exclusively at Sephora, this Japanese-inspired collection captures the true spirit of tokidoki: Every day brings another opportunity to dream. Cromatico Eyeshadow Palette - Bastardino ($25) A limited-edition eyeshadow palette that allows you to explore both your criminally cute and irresistibly edgy sides. 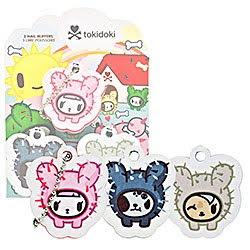 Cactus Pup Buffers ($8) These criminally cute cactus-pup nail buffers each featuring a key chain attachment that lets you take the playful tokidoki spirit to go. 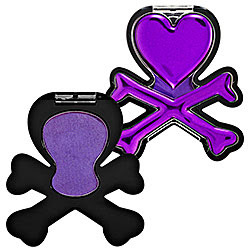 Cromatico Eyeshadow ($15) A bright, high-impact, highly pigmented eyeshadow housed in an iconic compact design featuring tokidoki's signature heart and crossbones. I love the looks of these, container with the skull and crossbone especially. Too cool. oops, heart and crossbones I meant.